Cognation: Blue Apron - changing or dying? 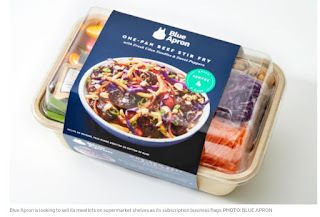 Interesting move by Blue Apron. "Blue Apron to Sell Meal Kits in Stores to Buttress Sagging Deliveries Move comes as retailers like Walmart, Kroger and Amazon offer their own kits in fast-growing segment"
Makes you wonder if this is the pivot to bigger and better eg the Kraft of pre-made kits....or the grasping of a dying venture capital created "industry".